i am loving gardein’s new vegan frozen food line, and finally it’s available in los angeles. i’ve already told you all about the amazing spicy buffalo wings, so today it’s all about chick’n good stuff. 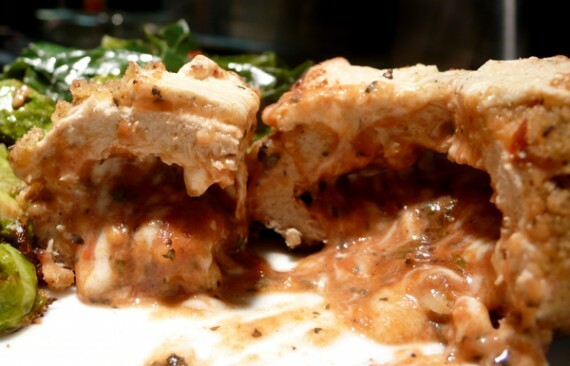 this little meal comes in packs of two and is basically a vegan take on stuffed chicken, complete with marinara sauce and daiya cheese in the middle. 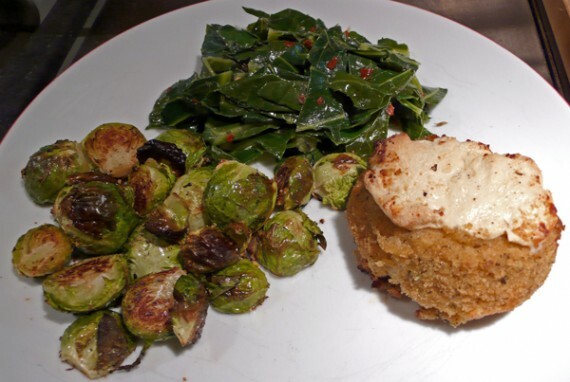 i topped mine with even more daiya cheese that i had on hand, and served it up with roasted brussels sprouts and collard greens. on bite of this thing, and i was SOLD. 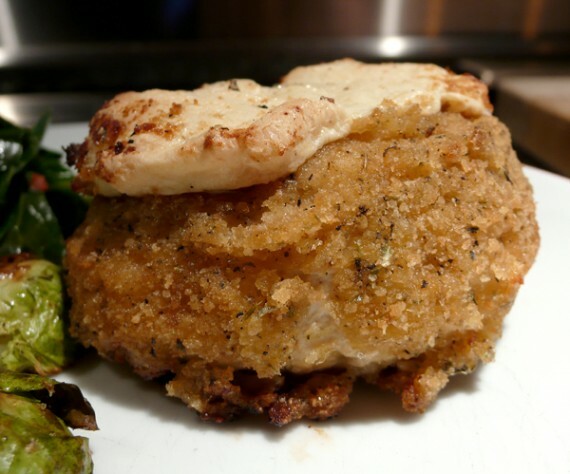 the crispy bread crumb coating was garlicky and flavorful, and the vegan chicken was moist and perfectly chewy. as soon as i cut into it, rich daiya cheese and marinara sauce oozed out of it all over the place. the sauce was awesome, and i’m sure you already know how amazing daiya is. i’ve never had a vegan frozen product this tasty….seriously! each stuffed chick’n is definitely enough for a 1 person meal…i even had a bit left over. these things pack so much decadent taste, i couldn’t believe it when i picked up the package and saw they only contain 210 calories each! i know i will be eating these on a regular basis. oh and it looks like i CAN be eating these on a regular basis, because they are available at ralphs! i’d never seen gardein at a normal supermarket before, so i was pleasantly surprised when i saw their entire frozen line in stock at ralphs in hollywood yesterday. and at just under $4.50 per bag, the price is right as well. 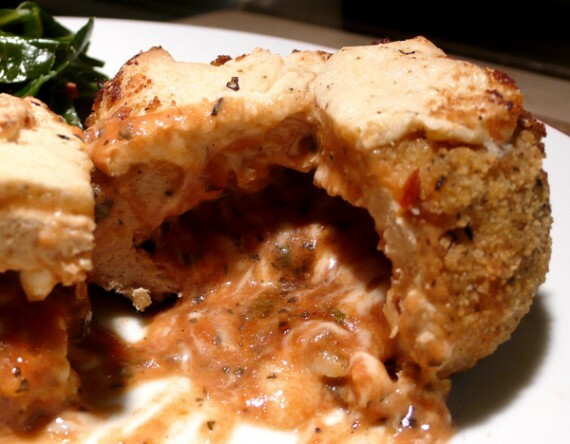 come on, it’s VEGAN CHICKEN stuffed with VEGAN CHEESE….available at the grocery store!!!! i never thought i’d see the day! I got the Yves beef strips made with Gardein the other day at my local grocery – SOOOO GOOD! Gardein is the BEST! These look like cheesy fried goodness too. yum! I wonder if my local ralph’s/albertsons will carry these too. I am going to buy some today! I just checked Gardein’s website and it says they are in Ralphs and Whole Foods. Oh Em Geee! I might have to get a package or two for Thanksgiving. OMG I wonder if they are at my Whole Foods! This sounds fantastic. ralphs?!!? I do hope it’s available at my local ralphs! looks like trader joes is trying to do thier own version of the stuffed chicken [just like they did with soyrizo, etc]. it’s no gardein, but it’s cheap, and still tasty. @mari: actually, i think the little stuffed vegan chickens at trader joe’s with corn and black beans ARE gardein. i love those! I can’t wait to head try these! They look so awesome. Guess I’ll be heading over to Ralphs! 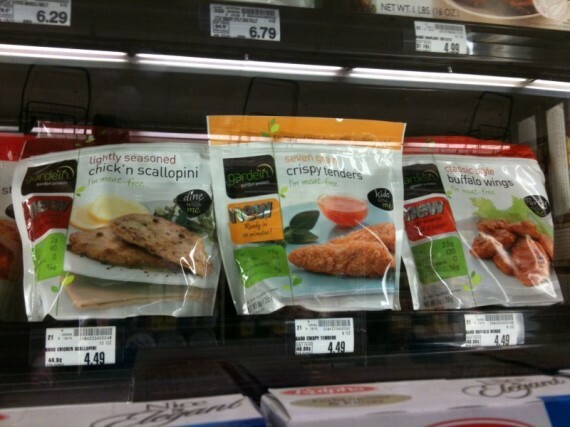 Fresh and Easy sells it, but they don’t call it Gardein. Oh man, when will these be available in DC??? The Fresh n Easy here in West Covina sells Gardein chickn breasts and steak cube thingies. I love the herb chickn breasts, so I will definitely check out Ralph’s for the frozen ones. omggg… I love gardein and I’m starving and this looks flipping amazing. No go at the Ralphs on Wilshire in mid-city, but I’ll find it. I am determined to have this for dinner tonight! Oh my God, you have such great vegan fake stuff over there in LA! I am hideously jealous! They have them at the newly redone Pavillions in WeHo. A little pricey for me, but they are there for the taking, along with some other variety of Gardeins. Yet another thing I wish I could get in the UK, they look seriously awesome! tried the stuffed chicken. it was good not great. needed more cheese 😉 and is still processed food so not sure of the nutritional values. Dude, the pulled BBQ is amazing. I ate the entire package! Which Ralphs in Hollywood? the one on Sunset or the one on Hollywood Blvd? very cool price and availability ! i found these at my local publix today in the tampa bay florida area. i bought the wings and the stuffed chicken. cant wait to give them a try. My 3 year old just gave the thumbs up to the Crispy Tenders. She dipped them in agave and loved it. Don’t think I have ever been so disappointed by a new food. Have to agree with brandibee, this just tastes so artificial and gross. They’re okay, but not close to the real thing. Similar in substance, but taste like non-meat protein. Somewhat disappointing considering all the hype. Hey does anyone know if they sell gardien over here in England as it looks really tasty? So… when can we Europeans enjoy this aswell?? We want Daiya and Gardein toooooo!!! !